Panda iMedia, one of China’s top online media holding companies, along with the New Mexico Film Office, the New Mexico Economic Development Department, the Albuquerque Film Office and The University of New Mexico, recently announced a cross-cultural media partnership designed to bring jobs, and a variety of opportunities in digital and online mediums. The film and media partnership announcement was made in the movie theater at UNM's Mesa Del Sol Facility. Panda iMedia specializes in the production of digital content and online promotion. The relationship between the New Mexico Film Office and Panda iMedia began last February and developed in the ensuing months into a strategic partnership involving Chinese digital media professionals who will study film production techniques with New Mexicans, while the state expands its film industry reputation to the most populous country in the world – China. The Chinese film market is one of the biggest in the world and is actually projected, according to the Los Angeles Times, to surpass the United States in becoming the world’s largest film market. This is news that could bode well for officials of New Mexico’s economic and film industry as well as others involved in the industry including UNM, which hopes to become part of the partnership academically. Chen Shen, chairman, Panda iMedia speaks to the media following the announcement that his company announced plans for a cross-cultural media partnership in New Mexico. Panda iMedia will also look to establish an Albuquerque office staffed with both Americans and Chinese post-production professionals, and also wants to work with New Mexico-based film productions. James Stone, chair of the Department of Cinematic Arts in UNM's College of Fine Arts, said the visit served as a learning experience for Chinese film officials and an introduction to the capabilities of the film industry in New Mexico. Stone hopes to develop an academic program that brings Chinese students to New Mexico and sends UNM students to China to study the film industry there. The Cinematic Arts program offers two degrees – a BA in media arts and BFA in Interdisciplinary Film and Digital Media. In his welcoming address to the Chinese delegation, Stone said: “Our students use this building to make and study movies. It’s my hope that students from China will very soon study here with us. James Stone, chair of UNM's Department of Cinematic Arts, welcomes representatives from Panda iMedia to Albuquerque. The relationship with UNM actually began several years before when Irene Ran, one of the executives for Panda iMedia in North America who was part of the contingent touring ABQ Studios, took classes from UNM in the Department of Communication and Journalism. Afterward, “she decided to setup a collaboration with her new employer, Panda iMedia, and the university she loves,” said Stone. As part of the announcement, nine stuffed dolls at the front of the stage were created by Panda iMedia illustrating their ability to create content in most any medium. 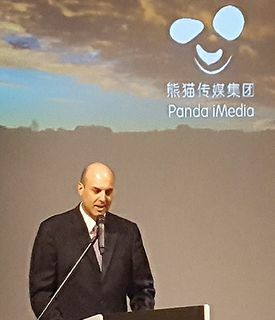 Panda iMedia Chairman Chen Shen said through a translator that the nine stuffed dolls -- resembling state film office director Nick Maniatis, Albuquerque film liaison Ann Lerner and other New Mexican film folks Panda has worked with to date -- represent his company's ability to create content in any medium. The dolls bared an uncanny resemblance to several of New Mexico’s film officials and brought a laugh to the crowd attending the announcement. 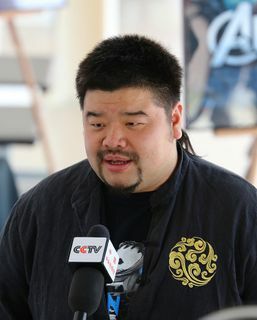 But “the easiest and most effective way to promote cultural understanding is through film and media," Shen said. "We hope that our media and short films can be a threshold to start this collaboration. We will try to use this opportunity to make our content more Americanized and meet the needs of local people. We also hope that American media content can be accepted and understood by Chinese people." 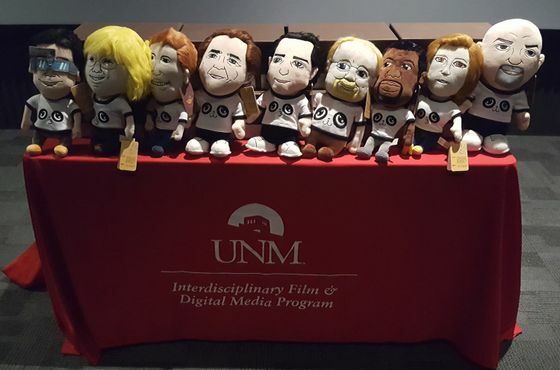 Stuffed dolls resembling state film office director Nick Maniatis, Albuquerque film liaison Ann Lerner among others represent Panda iMedia's ability to create content in any medium. New Mexico Cabinet Secretary of Economic Development Jon Barela also addressed the contingent on behalf of Gov. Susana Martinez. “I want to thank you very, very much for the time, the energy and your expertise in sharing your beautiful culture with ours,” Barela said. “This is a great opportunity for our state and for our two cultures, but I want to thank the brilliant and esteemed businessman Chen Shen (Panda iMedia chairman) for his vision and his collaboration. "We understand the importance of digital media and film and television production in China. It's a very fast-growing industry; an industry that we share here in New Mexico. It's an important part of our economy. This collaboration provides enormous opportunities for us, not only in terms of a cultural exchange, but in terms of job growth." About 40 digital media employees from Panda iMedia and business partners from Beijing came to New Mexico for the announcement and a weeks’ worth of introductions and training. The group toured Albuquerque Studios and attended a series of panels and workshops at Mesa del Sol. Topics included content creation, film distribution and promotion, Breaking Bad’s key to success, using cutting-edge technology to created amazing visual effects and the future of filming, gaming and the media industry. The group also went on several field trips around the state to get a feel for New Mexico including Tent Rocks National Monument, White Sands National Monument and Spaceport America.